Do we need another improvement in Wi-Fi? In one of the previous posts we discussed an evolution of the Wi-Fi standard. The 802.11 started in 1997 and since then we have had numerous amendments, that have improved the performance of wireless networks. Last discussed amendments, namely 802.11ac and 802.11ad allow to transmit data with the data rates up to 6.93Gbps. Do we really need more right now? Who could possibly use in practice such high throughput on daily basis? The truth is, such high data rate can be achieved in perfect propagation conditions with low interference. IEEE decided to take a step into another direction – focus on more common environment conditions instead of increasing peak throughput. 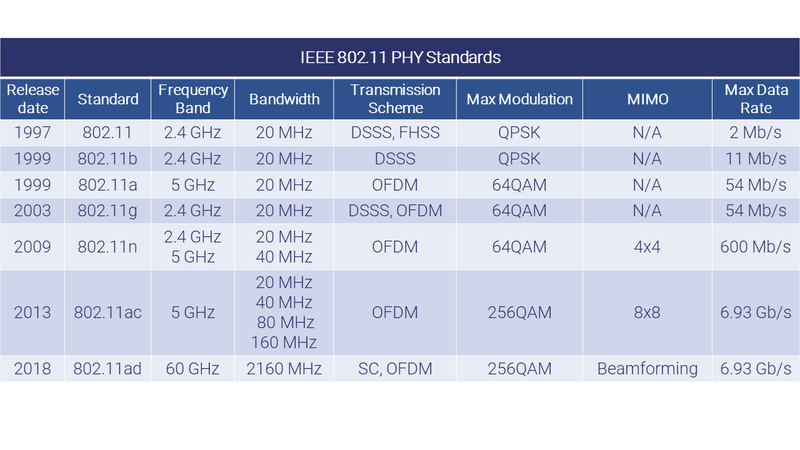 The amendment discussed in this blogpost, namely IEEE 802.11ax (also called HEW, High Efficiency WLAN) focuses on boosting average and worst-case scenarios, which will increase overall network performance. One more reason to introduce another improvement to Wi-Fi is the fact, that requirements also change over time. Some areas, like airports or universities, are more crowded than they used to be. 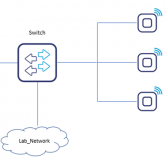 They are crowded in wireless terms – even if number of people didn’t change much, now everyone can have multiple devices that try to connect to the same network. Not to mention the IoT, where thousands of devices need low data rate connections. What does Wi-Fi need to fulfill these requirements? 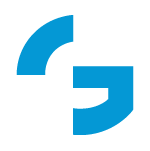 Let’s take a look on new features that enable such robust communication. Orthogonal Frequency-Division Multiple Access (OFDMA) is a concept similar to OFDM in terms of signal processing. Data is transmitted using multiple orthogonal subcarriers with relatively long symbol duration. This helps to deal with frequency selective channel. 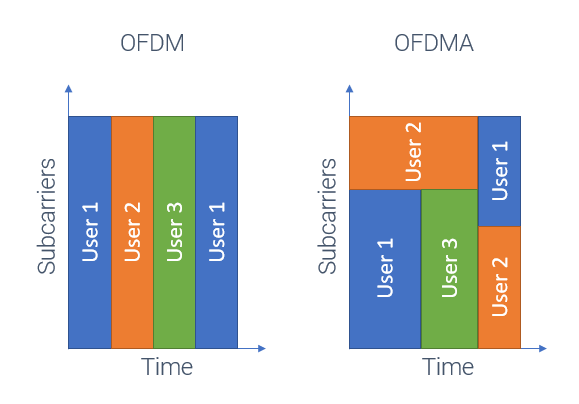 The difference is that OFDMA uses different subcarriers as a way of differentiating users. Unlike the OFDM, in OFDMA multiple users can receive data at the same time, so latency can be greatly decreased (See the figure below for reference). Since each user is in a different place, their radio channels also differ. This means that other subcarriers can be attenuated for different users. Using OFDMA, we can reduce impact of this effect. For each of the subcarriers group, AP can select user that have good propagation conditions. In this way, network performance can be increased, because we only transmit data on the resources that “are good” for this particular user. As new this is to the Wi-Fi, the concept of OFDMA was already used in 2008 LTE Rel-8 and even before for WiMAX. LTE and newer technolgies (LTE-Advanced, LTE-Advanced Pro, and even 5G NR) still use this technique as a multiple access method. 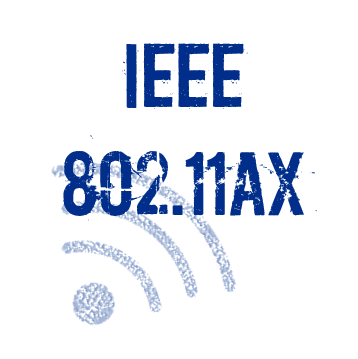 802.11ax extends MU-MIMO feature that was introduced in 802.11ac. Now, more user groups are supported, which makes MU-MIMO in downlink more efficient. What is also new, is uplink MU-MIMO, which initially was considered for 802.11ac, but in the end it was omitted in that amendment. 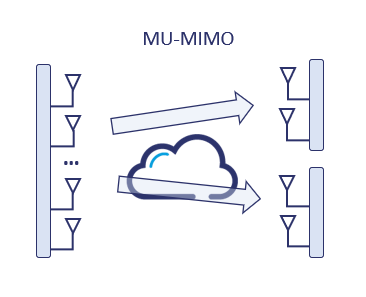 UL MU-MIMO allows multiple stations to transmit to the same AP in the same time and frequency, using different spatial signatures. Thanks to multiple antenna capabilities, AP can differentiate separate streams. MU-MIMO scheme is depicted in the figure below. 256-order modulation present in 802.11ac was increased by one more step. This show that, even though capacity increase and latency reduction was main focus, improving data rates was also considered. With 1024-QAM we can now transmit 10 bits in a single symbol instead of 8 (in comparison to 802.11ac). This however requires very good propagation conditions. Since 802.11ax can operate either in 2.4GHz or 5GHz band (unlike 802.11ac, which dropped 2.4GHz) we might encounter a problem of too few channels available (especially in 2.4GHz band). This is why 802.11ax uses, so called, channel coloring. Each channel is assigned a color, which identifies a groups of Basic Service Sets (BSS), which should not interfere. This changes Clear Channel Assessment method, as it will be more dynamic now. It can have different thresholds for different “colors” of the channels. If the network is designed in such a way, that channels with same color are far from each other we can set CCA to be less sensitive for such signal, because they are less likely to interfere with each other. Most important and worth noting improvement in terms of power efficiency is Target Wake Time (TWT). This mechanism allows negotiation between STA and AP time, during which STA goes to sleep mode. During that period STA doesn’t receive or transmit any data. Also AP doesn’t expect any data from this device, so it doesn’t drop it as disconnected. Then, after negotiated time, STA can wake up and transmit data. This is very common scenario in IoT environment, where sensors send data once every long period. In 802.11ax, device doesn’t have to be in “waiting” mode all the time, so power can be saved. 802.11ax can also be used with features extending range of the network. It can be useful in outdoor scenarios, when AP mounting can be problematic. Narrowband transmission – using only 8 MHz of the band reduces band noise. These changes make me wonder how many steps are there before fixed and mobile wireless networks will use the same technology and whether they will fully merge. Using OFDMA and being more aware of interference in Wi-Fi is surely step towards LTE-like technology. I am curious what next amendments will bring. 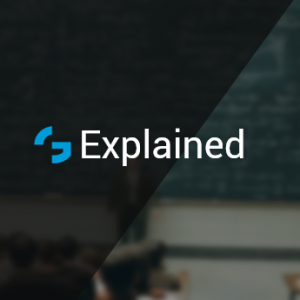 You might also find interesting a post about Wi-Fi standard evolution, while all our posts on WiFi can be found here.